Rock a mint military jacket with a beige suit for a classic and refined silhouette. Take your look into a more casual direction with FLY London dark brown leather derby shoes. 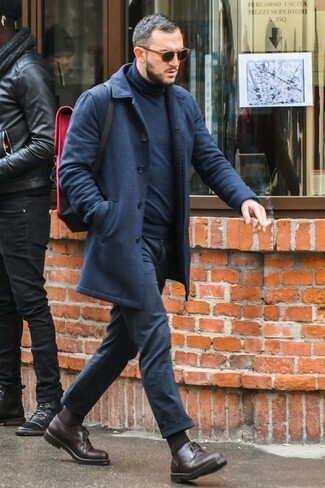 If you're on the lookout for a casual yet dapper getup, choose a navy barn jacket and black jeans. As well as super comfy, both items look great when worn together. Sporting a pair of FLY London dark brown leather derby shoes is an easy way to add extra flair to your ensemble. 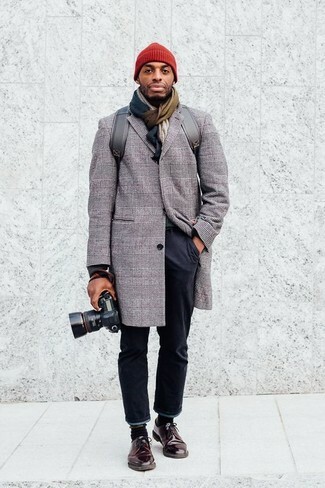 This combo of a grey plaid overcoat and black chinos is super easy to throw together without a second thought, helping you look seriously stylish and ready for anything without spending a ton of time combing through your wardrobe. Got bored with this outfit? Enter dark brown leather derby shoes to shake things up. For a smart casual getup, pair a navy overcoat with black chinos — these two items play nicely together. When it comes to footwear, this look is complemented wonderfully with FLY London hoco plain toe derby. So as you can see, being a dapper dude doesn't take that much the place of work. Just go for a black blazer and black chinos and you'll look good. 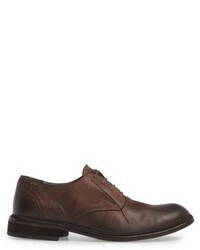 Amp up the cool of your getup by wearing FLY London dark brown leather derby shoes. If you're on a mission for a casual yet dapper getup, rock a charcoal check long sleeve shirt with khaki chinos. Both of these pieces are very comfortable and they also look great when paired together. 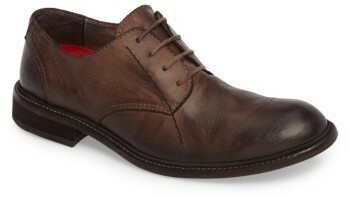 Amp up the cool of your ensemble by complementing it with dark brown leather derby shoes. 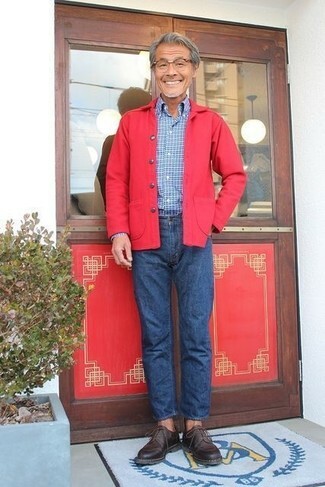 If you're searching for a casual yet stylish ensemble, consider pairing a red shirt jacket with blue jeans. As well as totally comfy, both items look great together. 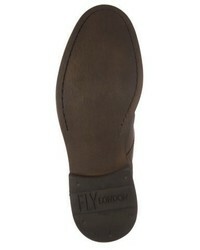 Bump up the cool of your look by rounding it off with FLY London hoco plain toe derby. 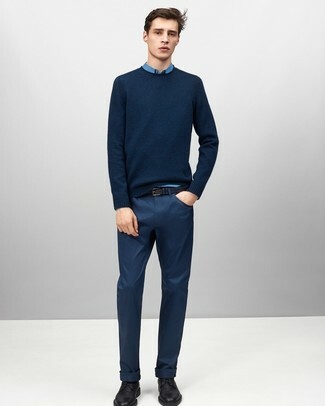 If you're on the hunt for a casual yet sharp look, try teaming a navy crew-neck sweater with blue chinos. These two items are super comfortable and will look great together. 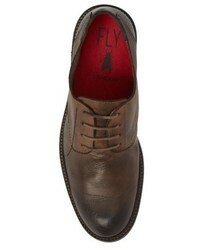 Lift up this ensemble with FLY London dark brown leather derby shoes. 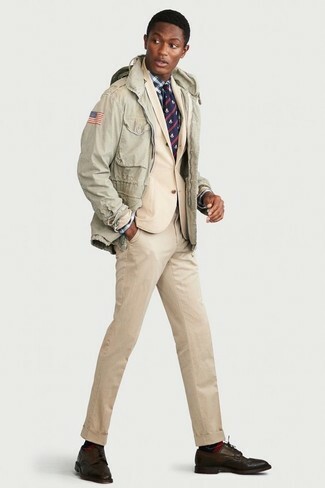 If you're on a mission for a casual yet seriously stylish outfit, wear a brown parka and tobacco chinos. These garments are very comfy and they also look wonderful when paired together. Elevate your look with FLY London hoco plain toe derby.